I'd been hankering after a maxi dress, and when I caught sight of the style & the pattern over this cool blue and cream Aztec dress* I wanted to see it on. I needed to be convinced it looked alright - and I think it does. It looks casual, relaxed and simplistic, at the same time as being elegant and striking. It's an easy to wear style with a drop waist on the back, three quarter sleeves and a V neckline with a tiny button at the neck. What more could you want? Pockets! Yes it's even got those - I love a pocket don't you? Just to hide a tissue, a phone, a lipstick or hands! My obvious choice of footwear had to be my ivory ankle boots. The colour compliments perfectly as do my pearl and grey beads. I was worried about the smock effect - worried it would make me look 'expectant', but I think I've got away with it! Maybe I could lend it to my expectant daughter!! 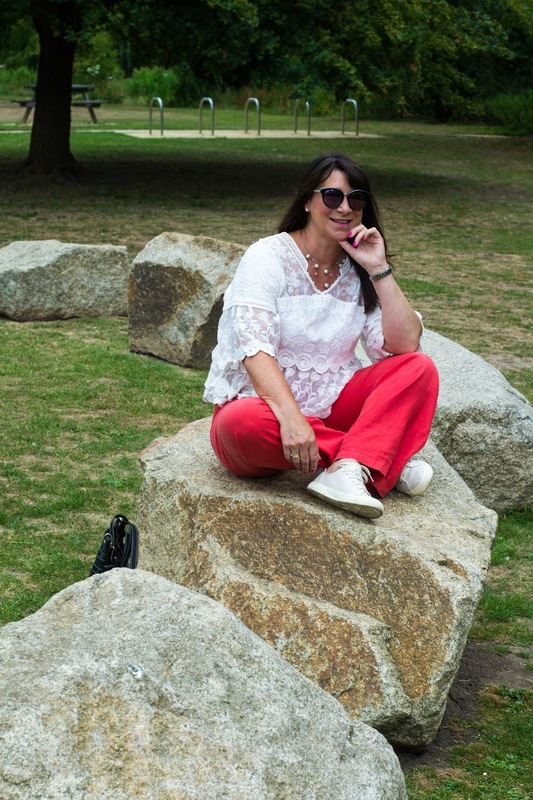 If you missed my earlier post sharing my Eva Trends white cotton shirt, why not pop over and view it here. Last week's favourite is Jess. She's wearing leopard print which I love. If you're thinking about buying anything animal print - just go for it. With leopard, cheetah & snakeskin amongst many prints all over the shops there will be plenty to chose from. 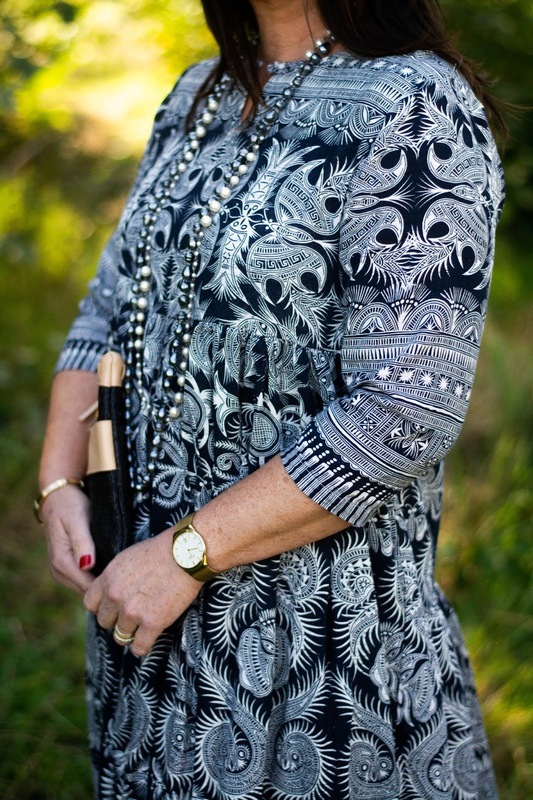 Find more from Jess on her blog Elegantly Dressed and Stylish. Link up your fashion and beauty post below - other topics allowed too! Labels: Eva trends, Next, T K Maxx. 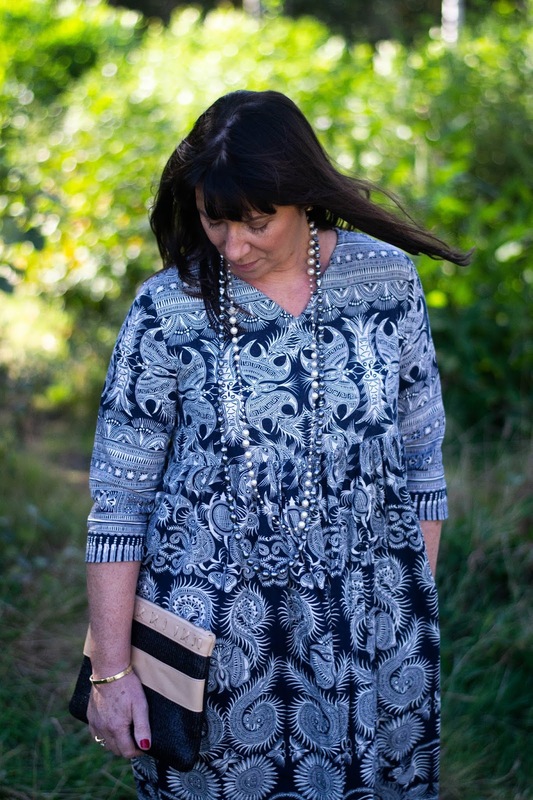 Beads fashion over Fifty. 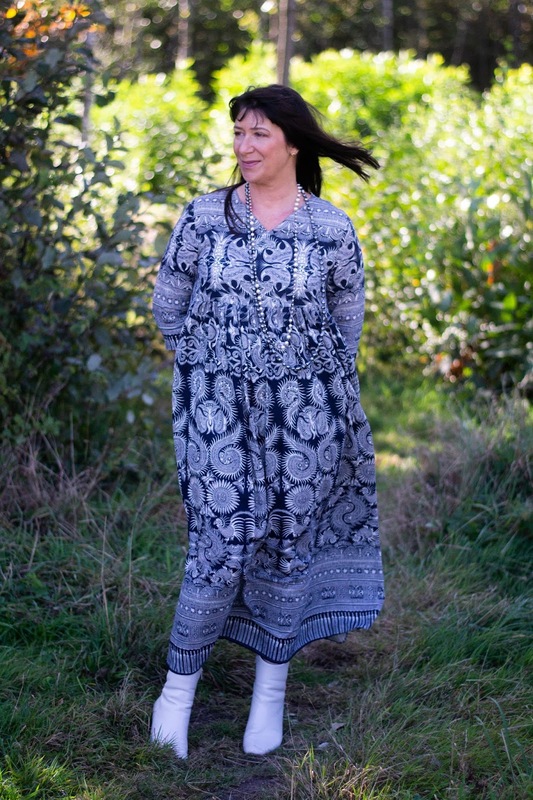 The print of that dress is just beautiful Jacqui! I'm on the hunt for some white booties and I love how you styled this dress with yours. Great look! This dress is fabulous, Jacqui!! It's one of those that takes center stage so you don't have to worry about anything else! Maxis are my absolute favorite! Yours is so fun, airy, and styled to perfection! I think the dress looks great on you. I really like the pattern. 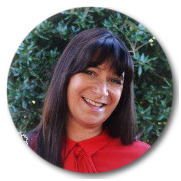 Thank you Jacqui for the feature! I have been loving long dresses too and yours looks lovely on you! love the print and with those booties, a fab look! 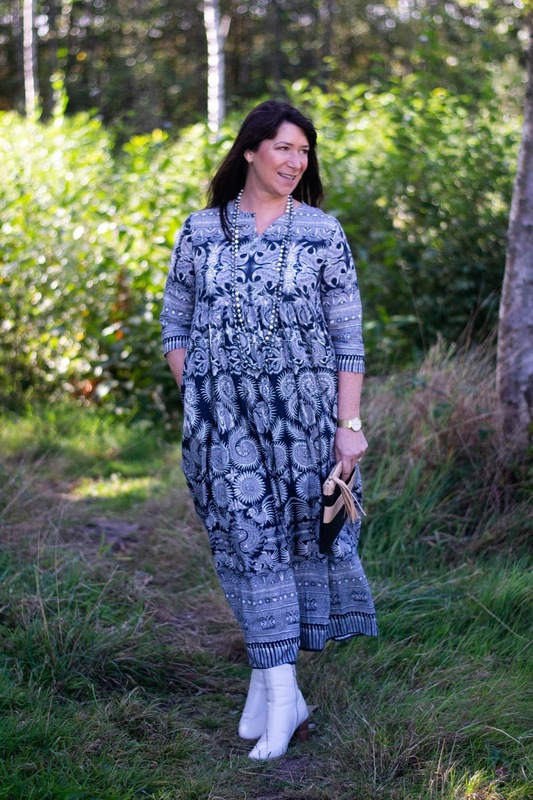 Maxi looks very good on you! The colour too. I really like this outfit, Jacqui! You've inspired me to look for a dress/booties that have this feel. It was a good choice. Jess was a great choice for a feature, she looks so pretty in her leopard dress. Jacqui, I love this dress! It is super cute and very boho chic! The white booties are perfect with it. Great styling, my friend! 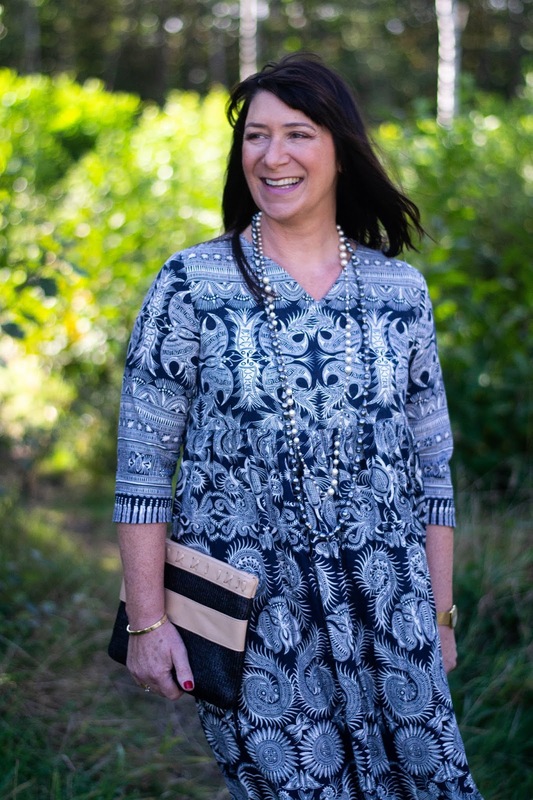 I've been approached by Eva Trends but wasn't sure until I saw your super cute outfit in today's post! I love the pattern and the blue looks amazing on you. And those booties...darling! that dress looks amazing on you! I love it with the white boots! That dress is so pretty! I love it with those booties! I've really been loving Eva Trends lately! 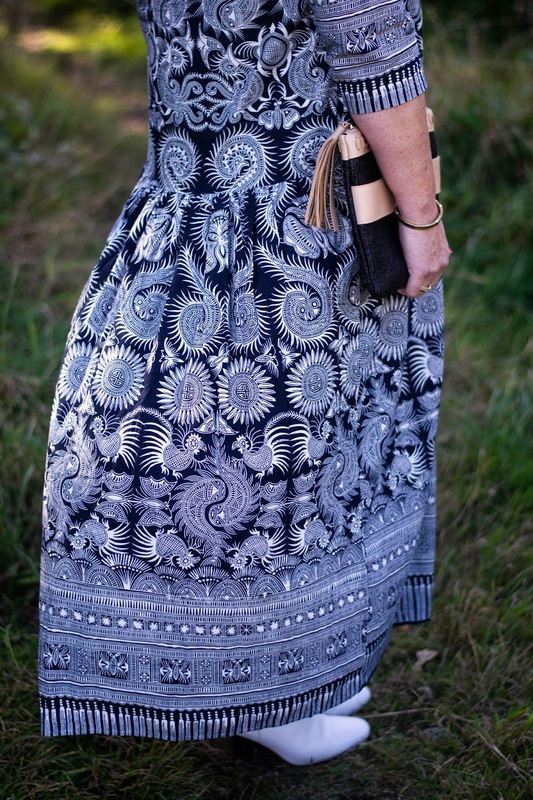 This maxi dress is gorgeous on you. I love the pattern, color and those ivory boots look great! 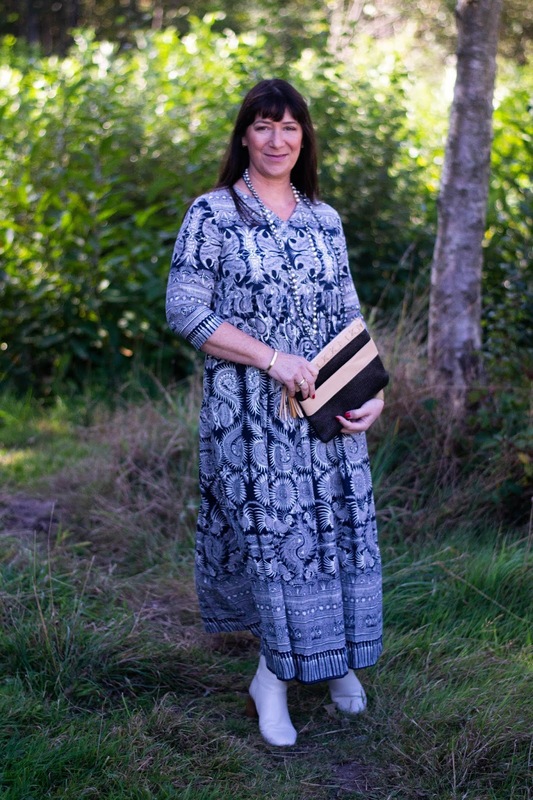 I absolutely adore the print of this dress, Jacqui and the style too – although I usually get put off things that say one size fits all! You look fab! Looks perfect fit on you! Hello Jacqui, you definitely own this dress.Such a good price too. It looks great on you and the colour compliments your skin. The details elevate this look to another level. Very pretty dress! I love the ivory boots with it!